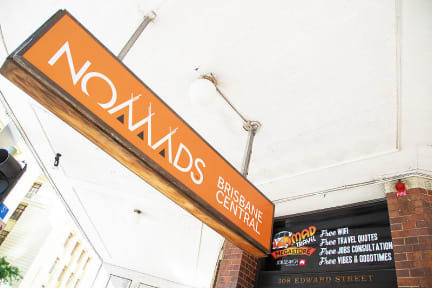 Nomads Brisbane i Brisbane, Australien : Boka nu! Nice hostel. The location were really good and the rooms were really good and clean. The only bad thing about the room is that there weren't really any place to charge your electronics, but other then that it was good. The staff were nice and the bathrooms and the toilets were clean as well. The elevator were not the best one but you'll make do. Nice location close to shops. It had a nice rooftop with outdoor cinema and BBQ. The bad thing was the rooms cause we didn't have air-con or a fan so it was HOT!! The elevator was very old so the doors didn't close everytime so sometimes we had to walk all the way to the top. Otherwise a nice hostel. Clean hostel but it was to big with too many people. Kitchen was too smal for all the people. The wifi was bad and you only have it from 7am-7pm. Otherwise a good hostel. I chose the hostel because of the central location since I had an early flight to catch, but I couldn't sleep at all until the nightclub below closed, it was brutally loud. Good hostel with a good bar under it, still a bit dirty and the bathrooms can be very bad sometimes. Worst hostel i’ve stayed at. No AC, everything was dirty, only one working toilet on our floor, didn’t feel safe in the hostel.The room was way too small and had holes in the wall so you could see and hear people in the hall. Only 4 outlets for 6 beds. Most of the staff didn’t seem to care, they advertise as “free wifi” but it only works at reception 7-7. Elevator was dangerous. One staff member recommended us to leave when they saw our disgusting/hot room. ONLY good thing was the location. Location was amazing. Unfortunately, nothing else was. Room was okay but had a bit of an odor. Floors didn't feel clean. In the bathroom, the booths had such large gaps that you could easily see the person sitting there. Roommates were awful, came in at 2 AM and made heaps of noise for almost two hours. Lobby had very broken and run down furniture. Some outlets in both room and lobby has been ripped from the wall, and were now just cables hanging out. Stuff was rudd, smells bad, elevator was brooken, no free wi-fi only for 12h 06-18.